In April, the Trump administration implemented a policy that they described as a "zero tolerance" approach to immigration. As a part of the policy, families who arrived at the United States border were separated. Parents or guardians were taken to adult detention centers while the children were and continue to be held in centers specifically for youths. Reports indicate that such separations happened to both families attempting to cross without authorization and those seeking asylum. The policy lasted only two months before public outcry and additional pressures convinced the administration to end the separations. In the time since, the government has been ordered to reunify the parents with the more than 2,000 children taken from them. The process has been slow. It is evident that no plan was created prior to the separations for reunification, making connecting the children with their guardians still in the United States extremely difficult. On top of that, an estimated 400-plus cases exist in which the parents were deported while separated, potentially leaving the children "permanently orphaned." Even if every child and parent are reunited, the effects of this policy on those separated will be long lasting. The trauma of the separations will impact children, parents, and entire family units. To best understand the impact the separation of families will have on the children and their guardians, one must first recognize that the trauma at the border is not the first trauma they have experienced. 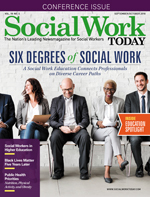 Mark Lusk, EdD, LMSW, a professor at the University of Texas at El Paso School of Social Work, explains that there are, broadly speaking, two types of migrants—economic and forced. Economic migrants travel across borders for employment. This grouping may include individuals who work seasonally, who are seeking a better standard of living, or who have simply located job opportunities in another country. "There has always been the pattern, the flux back and forth [of economic migrants]," Lusk says of the migration between the United States and Mexico. "Forced migrants," he continues, "are people who believe that they have no alternative but to migrate in order to maintain their integrity, safety, and even life. They flee natural disaster, civil war, famine. They flee risks to their own personal safety." In recent years, there has been an increase in forced migration to the United States from several Central American countries, most commonly Mexico, El Salvador, Guatemala, and Honduras. Each of these countries contains their own dangers and challenges. Mexico, for example, has seen a rapid escalation of violence as the government attempts to crack down on drug cartels and the drug cartels attempt to maintain and gain control of territory. As a result, individuals migrating from these areas are most commonly doing so to protect themselves. "These were not economic migrants," Lusk says of the individuals who have migrated to the El Paso area since 2007. "They were not coming to work seasonally or long term. These were people who had their businesses burned, had been extorted, or had extreme acts of violence committed against them." What's more, the journey from home to the border is not always safe. "A lot of things have happened along the way," says James L. Griffith, MD, chair of the department of psychiatry and behavioral sciences at George Washington University School of Medicine and Health Sciences. He notes that the children have witnessed abuse and violence prior to and during their flight. "Along the way," he says by way of example, "young teenagers have been sexually assaulted," among other atrocities. As a result, many of the individuals arriving at the border from Central America are doing so already coping with trauma. And for those who arrived this past spring, they were further traumatized by separation. "If you separate [a child from his or her parent], you first see extreme protest, much crying, much agitation, and then the child goes into despair. This is what's happening at the border," Griffith says. Elizabeth Barnert, MD, MPH, MS, an assistant professor of pediatrics at the David Geffen School of Medicine at UCLA, adds that the separation leads to toxic stress. "Toxic stress occurs when children lack a loving, trusted caregiver to calm and soothe them in the face of stressful events," she says. "Exposure to toxic stress creates a 'wear and tear' on the body that is very harmful to health." In the short term, the children are terrified. They do not understand why they have been separated and do not know where their parents are or whether they will see them again. "Meanwhile," Barnert says, "parents may feel afraid and desperately want to reunite with their children. This [family separation] is especially difficult when the separation feels out of the control of the family." Lusk further notes that in childhood, "the parent and child are not fully separated in psychological terms. They're still very close. The absence of the parent, especially when they see the parent removed, is extraordinarily traumatic." The long-terms effects of toxic stress are wide ranging and can include anxiety, PTSD, and depression. For younger children, the trauma of the separations is likely to affect their attachment. "The biggest problem," Griffith says, "is that people think about little children as small adults, but they are not. The brain of the child is still developing, especially in regard to brain systems for memory and relationships. "There are two different memory systems in the brain for events stored as emotional memories and events stored as memories of events. The emotional memory system organizes the brain around what will be the expected environment—what is safe, what is unsafe. The most important emotional memories are about attachment relationships—which relationships are safe or unsafe, reliable or unreliable. This emotional memory system is mature and fully functional from birth," he explains. "Its attachment memories are permanent and will last into adulthood and over a lifetime." Griffith explains that when there are disruptions in the child's life, the child may develop an insecure, rather than secure, attachment. A secure attachment gives the child an understanding that the world is safe and trustworthy, whereas insecure attachment can lead to "difficulty tolerating stress, poor control of anger, [and] difficulty maintaining stable relationships," Griffith says. The ramifications of developing insecure attachment are typically long term. Additionally, the effects can spread across generations. Griffith explains that, for example, the rate of PTSD for children of survivors of the Holocaust is three times that of the general population. "If you have a parent with an insecure attachment disorder or a parent with chronic trauma symptoms, they may be very limited in their ability to provide stable, nurturing parenting relationships for their children, which can impair the next generation," he says. Beyond the individual, a trauma such as a family separation impacts the family unit. Should the parents and children be reunified, all will not be instantly well, as each individual member struggles with their own experiences and how it changes their role in the family. Lusk notes that as the reunifications have begun, some are observing a hesitation on the part of the child. "Some of the reporting on that indicates that when children have been reunited, in some portions of those reunifications, the child has been uncertain about what was happening—uncertain even of the mom—and has said things such as, 'Why did you leave me?' That's concerning because they're not sure why this happened and may be blaming the mom or the dad," he says. Barnert adds that when this occurs, "family members must come together and face the individual traumas that caused the separation. They also must learn to rebuild trust and come together again as a family." Should the families not be successfully reunited, individuals may face the lasting effects of ambiguous loss (a loss without closure). The individual does not and never will know whether reunification may occur. "Ambiguous loss," Barnert says, "creates an uncertainty that prevents individuals from being able to grieve; instead, they are, as stated by [human rights researcher and advocate] Eric Stover, 'caught in a limbo world of hope and despair.'" It is clear, then, that the families affected by the current administration's separation policy need services to help them cope with the trauma that has occurred. It is possible for the individuals and the family units to find some healing, given the opportunity, resources, and tools to do so. Griffith says that a key to working through such a trauma is bringing the families back together as quickly as possible. "If the core family unit can stay intact, that accomplishes a lot. [There's a feeling of] 'As long as we're together, we can be okay, regardless of how harsh the circumstances,'" he says. However, the reunification process thus far has been plodding and uncoordinated. It appears that far too many families will remain separated long term. In addition to reunification and in the face of indefinite separation, family members should have access to psychosocial services to help them cope. Unfortunately, it is unclear what services are currently available to the children still separated from their parents. "We don't have access to those facilities," Lusk says. For those individuals that social workers and other professionals are able to reach, much of the services are being offered pro bono. "We're volunteering our services in tandem with organizations like Las Americas Immigrant Advocacy Center and the Diocesan Migrant and Refugee Services," Lusk says, adding that more than 200 mental health professionals in Texas are prepared to offer testimony on behalf of those seeking asylum. "The more immediate need," he adds, however, "is data entry, handing out travel kits, getting clean new clothes for children. On Maslow's hierarchy of needs, we're doing safety, security, nutrition." To date, it is unclear exactly how many families will be reunified and how many will remain separated indefinitely. It is further unclear, despite timelines and orders from judges, exactly how long it will take to connect the children and their parents. What is clear is that the cruelty of this policy will linger for many years to come. — Sue Coyle, MSW, is a freelance writer and social worker in the Philadelphia suburbs.